It may seem unambitious to set a bar so low, but Senegal’s post-colonial history of never having experienced a successful coup or particularly harsh authoritarianism is rare in its corner of west Africa. Over the past decade or so each of its neighbours has seen a military takeover, or at least an attempt at one. And whereas many in the neighbourhood have rigged their elections, Senegal’s have generally been seen as relatively fair, making a recent lurch away from openness all the more worrying. Voters go to the polls in Senegal to elect a president on February 24th (a day after Nigerians are meant to do the same), amid mounting concerns over the health of their democracy. 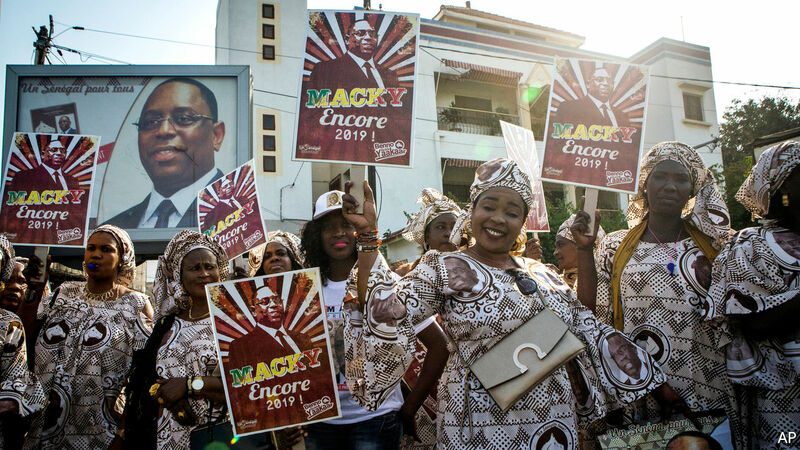 Opposition parties have accused Macky Sall, the incumbent, of trying to skew the result in his favour. The two most popular opposition candidates were barred from running because of corruption and fraud convictions. On top of this, last year the government introduced a law making it harder for people to qualify to be a presidential candidate. Senegal’s list of candidates is the shortest it has been in decades. Mr Wade’s influence is limited. He lost much of his credibility after he ran for an unconstitutional third term in 2012. His once-powerful Senegalese Democratic Party does not have a candidate in the race because Mr Wade’s son, Karim, was among those barred from running. Even so, Mr Wade’s calls for violence are worrying. Two people have already been killed in electoral violence in eastern Senegal and more have been injured. Civil-society groups are worried that freedom of expression is being squeezed. Y’en a Marre (“Enough is Enough”), a collection of rappers and journalists who mobilised younger voters against Mr Wade in elections in 2012, has come under pressure from the government in recent months. Its donors—which include a charity, Oxfam, and OSIWA, a group financed by George Soros, a philanthropist, which works throughout west Africa—have been questioned by police about their links to the protests. François Patuel at Amnesty International, another charity, said the police action was a sign of the government trying to intimidate civil-society groups in the run-up to the election. Mr Sall has all the advantages of incumbency. He is widely known across the country and is popular in the countryside. Amaka Anku of the Eurasia group, a political-risk consultancy based in New York, thinks he will win more than 50% of the vote against a divided opposition and thus avoid a run-off. But whatever the outcome, many will argue that west Africa’s beacon of democracy is not burning as brightly as it once did.